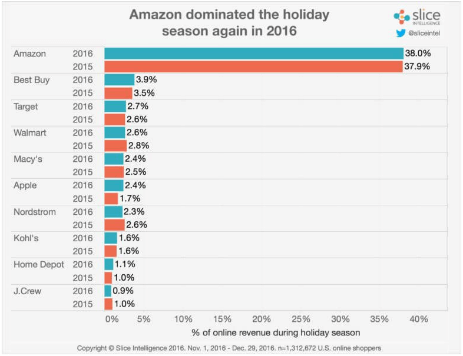 For the second year in a row, Amazon dwarfed the online competition with nearly ten times more holiday sales than Best Buy (Bloomreach). By providing consumers with a great site experience and boasting features like “Prime Shipping” and “Buy with 1 Click,” Amazon has managed to outperform its competitors. And while Amazon is categorized as an online retailer, it’s also being used by consumers as a search engine. In 2016, more consumers began their product searches on Amazon instead of Google, Yahoo or Bing. Visibility on Amazon is the key to selling on Amazon. All brands must seek to optimize their organic Amazon listings against their competitors, just as they would on Google. While reviews, ratings and a product’s popularity are extremely influential in ranking factors on Amazon, we will focus on the factors that can be controlled in this article. When it comes to optimizing a product’s title on Amazon, today’s best practices are largely ignored in favor of keyword stuffing. When SEO was in its infancy, web pages would include as many relevant (or sometimes irrelevant) keywords as they could in order to be pulled in for a variety of searches. In an effort to improve the search experience, search engines picked up on this spammy behavior and began penalizing pages that employ this tactic. Since then, sites that overstepped boundaries and began ranking for keywords unrelated to its content saw decreased rankings. To an extent, Amazon operates in a similar fashion by encouraging product pages to include pertinent secondary information in the titles. Amazon provides general guidelines within its “Help” section on how to write product titles for several common types of products. Brands can grasp a sense of what information is common to include with their industry by using Amazon’s Product Guide. Some products, like electronics, should contain a model number in their title while bath towels typically do not. Amazon’s bullet points found to the bottom right of the product image have a larger impact on ranking than the long form product description found farther below (Moz.com). Paying special attention to this field is vital and should follow conventional SEO principles. Namely, brands should include relevant keywords in this area as this is one of the first places users will look for further information. Do not overstuff keywords. These bullets can be replaced with more relevant information as the brand sees fit as they are solely meant as an example. While it may be important for some products, including construction information on a video game – for example – provides no value to users. It is up to the brand whether or not their research dictates which aspects of the product are most important. Performics has found that the Frequently Asked Questions section of a product provides meaningful insight into what factors users are most interested in. These insights may reflect what is placed in the product bullets. Product descriptions on Amazon should contain major features of the product with a neutral tone. This is the place to expand upon the claims made in the product bullets. According to Amazon’s help guide, this long form description should be similar to the product’s description found on your site, but should not mirror it. Information on the materials and construction (if applicable), product features, controls and settings, and available parts and accessories should be placed here. Include the primary and secondary keywords associated with the product. Customers like to see detailed images of a product before making a buying decision. Amazon encourages sellers to include product images larger than 1000 x 1000 pixels. This is the minimum size required to active the zoom feature which Amazon claims is a proven way to enhance sales. Enhanced sales also benefit rankings for the product, which also lead to more sales. It’s also important to include as many images (with different angles) as possible for each product page, and include a product trailer/video if available. The “From the Manufacturer” section of an Amazon product page is a place for brands to leave their mark. Most brands utilize this section for either product instructions or providing a value proposition. Brands have also used this space for positive reviews from third parties or answers to frequently asked questions. While there is already a section dedicated to answering common questions, providing these answers up front are appreciated by shoppers. Instead of submitting a question and waiting for an answer, hesitant shoppers can get all of their information up front. Optimizing your value proposition within the “From the Manufacturer” section can separate an average product page from an excellent one. Amazon provides sellers with an opportunity to include additional product-related keywords in fields such as search terms, subject keywords, style keywords, etc. These keywords should only include relevant information that is not already captured by other fields such as product name, key product features, product description, brand name, etc. If a keyword provides valuable information about your product, then it belongs in product description or key product bullet points. The main use for these additional keyword fields are for common alternate names or abbreviations for products or their functionalities. Go to Templates for Specific Categories to select the appropriate inventory file template. Enter your product information and include the new category in the Item Type Keyword field. Upload the file by going to the Add a Product via Upload page. Leveraging these optimization techniques, Performics was able to drive a 4x higher Amazon ROAS vs. Google and an 82% Amazon ranking lift for a global electronics client. To optimize your Amazon listings, contact Performics today.